Last year I stopped at a little Mennonite store in the country while visiting some family in Wisconsin. Among the fun handmade things I found, I picked up a bag holder that I just love! I’ve been happily using it ever since and I keep it on a hanger on the back of my pantry door. It’s very nice to keep the bags put away and off the floor, but easily accessible when I need them. I decided to put together one of these simple Bag Holders as a gift for my sister who recently moved into a new house; a nice little housewarming gift! 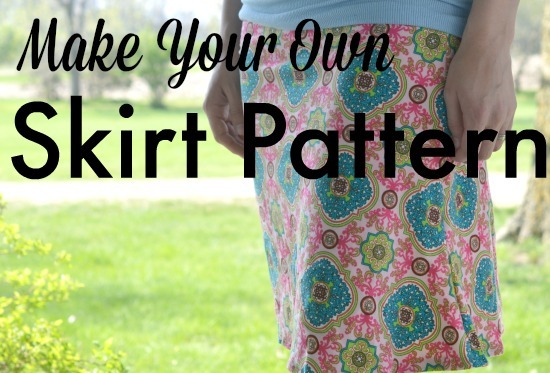 These are easy enough to put together, so I’m sharing my sewing adventure here so you can make them too! 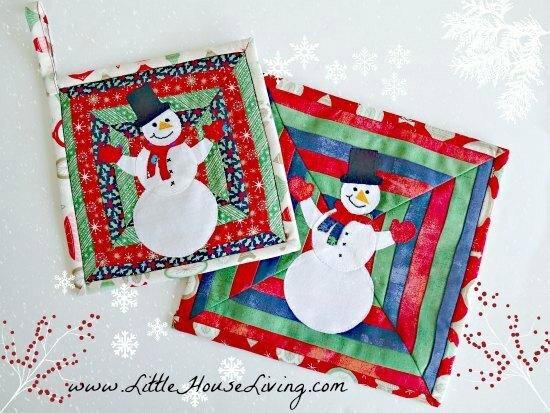 All you need to make this project is 1/2 inch elastic (at least 20 inches) and a piece of fabric that is cut to 24 inches long and 15 inches wide. I used a light upholstery fabric which I got from Fabric.com to make mine heavy duty. You can use cotton if that’s all you have on hand. 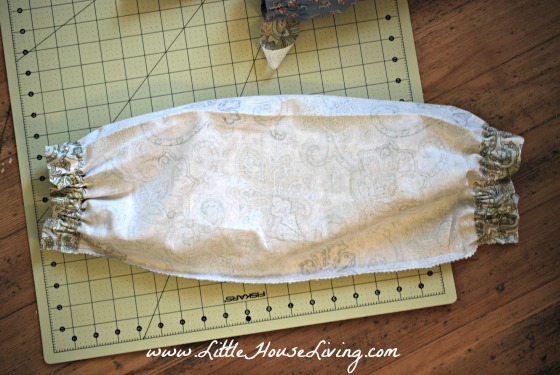 Take one of the short ends (the 15 inch sides) and fold over 2 inches. 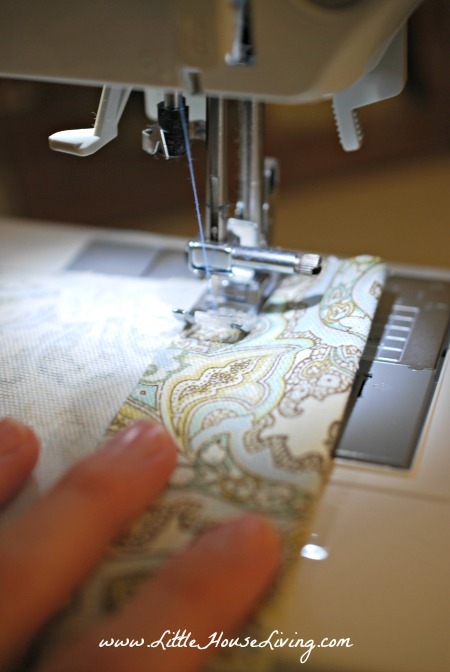 Sew a wide hem. Repeat on the other side. 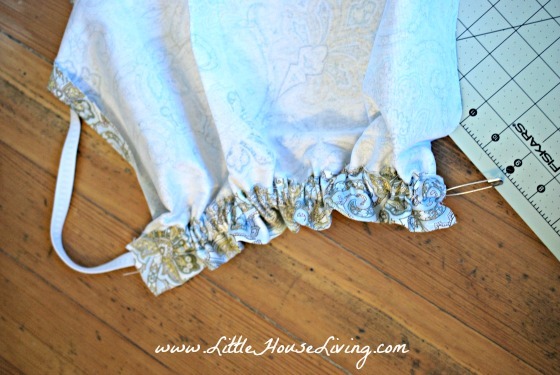 Then sew down the middle of your wide hem, making a pocket for the elastic and a little ruffle detail on the edge. 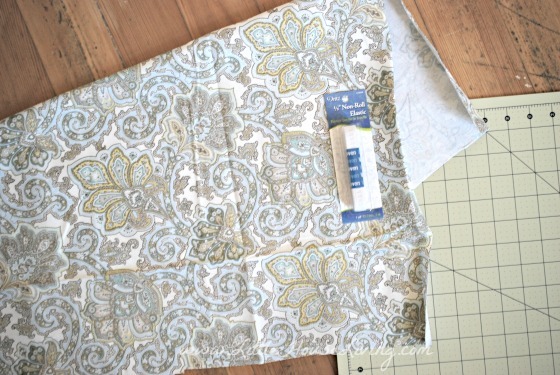 Take a 10 inch piece of elastic and pull it through one of the pockets (using a safety pin will help make this easier). Pin the ends of the elastic together (with the wrong side of the fabric out) and stitch so they stay together. Repeat on the other end. Then sew the long sides of the bag fully together with the wrong side of the fabric facing out. 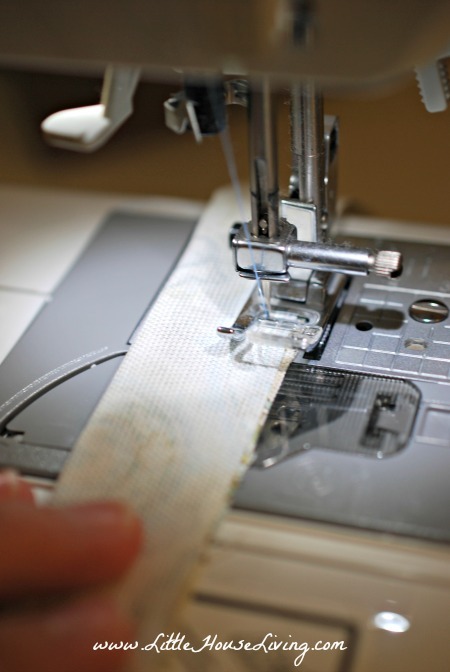 Trim off any excess fabric. This is what it should look like when you are done with those steps! Almost finished! 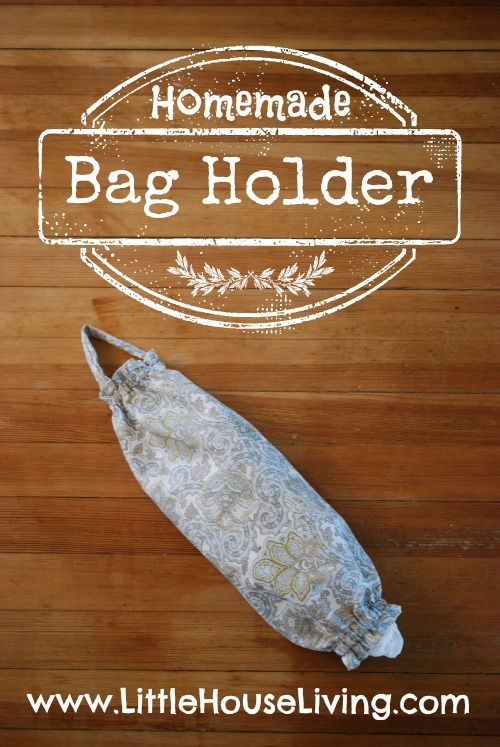 Make a hanger for your bag holder by cutting a 3 inch by 15 inch piece of fabric and sewing it into a long tube (right side out and then flipping it the correct way). 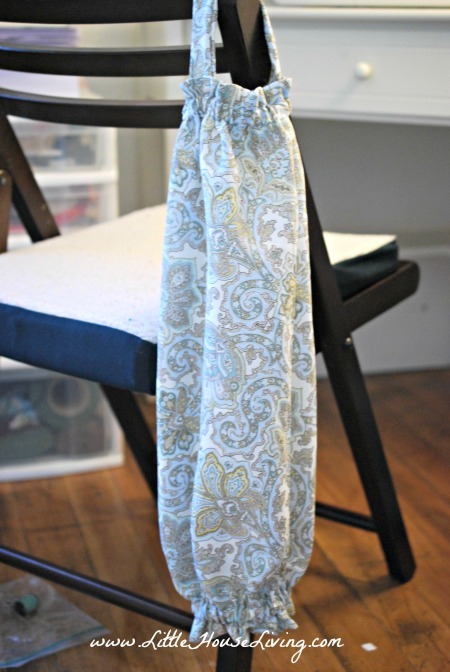 Sew this handle onto the top of your bag holder. 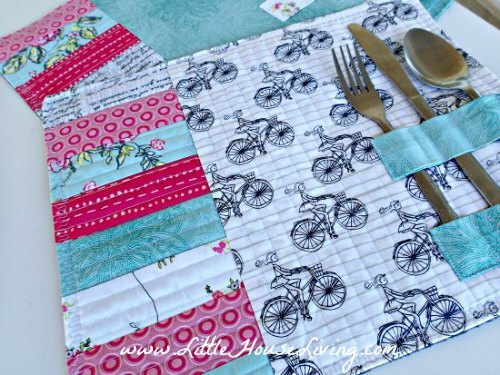 If you don’t want to make this using fabric you could also use ribbon. Turn your bag holder right side out and you are done! Hang wherever you store your bags. I have mine hanging on the back of my pantry door. 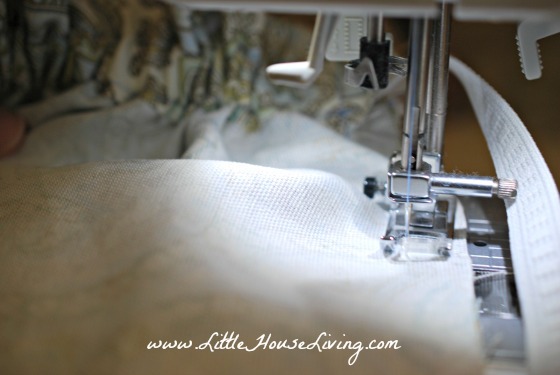 Find even more super simple sewing projects here on Little House Living. 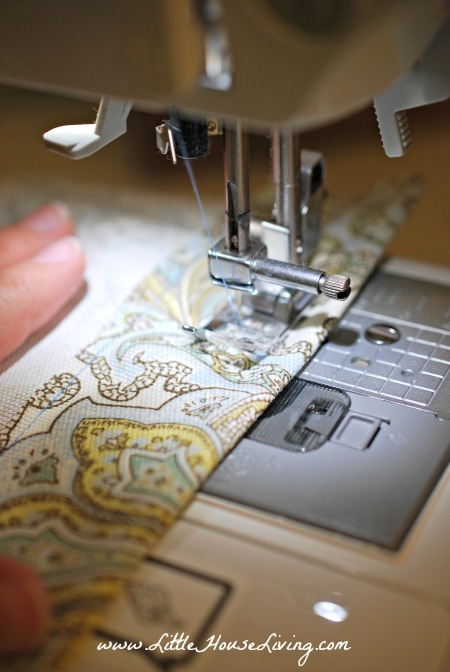 What are some of your favorite easy sewing projects? Great idea! Beats the usual ‘bag of bags’ we end up with in the kitchen, or clogging up a drawer somewhere! I might have to give this a go! You can also use these to hold a rolling pin with the pastry cloth and rolling pin cover. I use it and it’s wonderful, it keeps it clean and I know where it is all the time. Great post. It makes saving bags so pretty. I need to do this, we have a bag full of bags right now! We take them to be recycled fairly often but in between they are always a mess. I am not very handy with a needle, do you think I could use that stuff hem glue stuff? Very nice and great tutorial! I used to make bags kind of like these back in the 80’s! I was thinking of making some more to sell in my Etsy shop out of those old fabric calendars (I have a whole bunch!). I try to use reusable grocery bags but dang it if I still don’t end up with those dumb plastic one’s sometimes!! Your timing is perfect Merissa. I’ve had my old bag holder for *cough cough* years and really need to make a new one. I was going to Google for a pattern, now I don’t have to. Thanks so much for sharing at Thriving on Thursdays last week. Always great to see what you’ve been working on. I’m featuring this one at tomorrow’s party. I made these in the 80’s using terry cloth hand towels. They tame the bags and make them so easy and convenient to use. I just made this for my niece and now I’m making one to use in my classroom for sending wet clothes home in or for tying up poopy diapers before disposing of them. Made this 2day. I’m a new sewer and found this super simple. So cute! Love ur projects!! Thank You! I’m so glad you enjoyed making it!